Daniel, I would have loved to analyse the Uganda v Morocco game but I didn’t watch the whole match. I understand Morocco had most of the possession in that game but finally lost 1-nil. As you suggest, this must be a worry for their coach Eric Gerets. 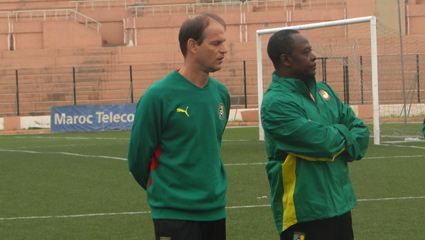 It’s something he needs to fix before the AFCON starts in January 2012. From what I watched against Cameroon, the strikers seemed ‘hurried’ when taking the final shot. It seemed they were under pressure to score and free themselves of a burden. They were thus unable to collect themselves, pick a spot and slot the ball. On that night, Cameroon had in Samuel Eto’o,a striker who needed just one chance to hit the target. That’s what Morocco need. I am sure Arsenal fans will not agree with me, but I would have to say Marrouane Chamakh is the one who could help Morocco in that regard. Taraabt of QPR has to focus. He’s talented but that’s not all there is to be a great player.